I'm a DIYer (do-it-yourselfer), I like doing minor repairs and maintenance items on vehicles myself. I'm not a mechanic but sometimes I pretend I am, LOL! So I got under my vehicle, was able to locate both O2 sensors, and boy oh boy was the front O2 (A/F Ratio) sensor up in a tight spot! Since I don't have a heated garage and this was February I decided I'd just let the dealer do the proper diagnosis and repair. I took it in, the repair was covered under warranty. The dealer replaced that front air/fuel ratio sensor and everything was good. As a result of the trouble code and not being overly familiar with hybrid systems, I decided it was time to get a decent repair manual for my car. I hadn't owned a Prius or hybrid car before and so I only had a limited knowledge of how the systems worked. 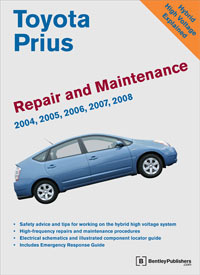 I discovered factory Prius shop manuals can be had for anywhere between $500 and $1,000. As soon as I saw the cost, I decided that was probably more info that I'd need. After all the car is still under warranty for another 2+ years and even if it was out of warranty there would probably be some jobs too big for me to tackle! That's when I discovered the Bentley Publishers 2004-2008 Toyota Prius Repair and Maintenance Shop Manual. At a retail price of $69, it sounded like a more reasonable price ;-) I did some searches on the net to see what others were saying about the manual. I had came across one forum thread at PriusChat.com which mentioned the manual but nobody had any real review of it. Some folks had previously bought a Bentley Publishers manual and were pleased, so I decided to buy one. I checked the usual places for the manual - eBay, Amazon.com, etc. I live in Canada so I found it on sale at Amazon.ca for just $55 CDN with free shipping. That was the best price I could find so I bought one. At the time of writing this article, the manual is available for $44 US from Amazon.com, the lowest price I've seen yet. The manual arrived in about a week or so. It's a good hardcover book, I didn't read the Amazon listing all that closely but I was just expecting a paperback manual for that price. So as soon as I could get it out of the box and the plastic off, I opened it up and started reading. The first three chapters (96 pages) of this book include oodles of full color photos. I was surprised to see so many color pictures. In all, there are 830 photos, illustrations, and diagrams. I was able to look up where that connector was for the A/F ratio sensor that failed. In fact, they even had a full listing of DTC codes, although you can find the codes online easily for free.